She Who Must Be Obeyed announced she wanted brochettes for dinner. This is no problem, I love brochettes. I found some boneless skinless chicken breasts in the fridge and fired up the Louisiana Grills Pellet Smoker. I mixed up the glaze ingredients. I cut the chicken to 1 inch cubes. 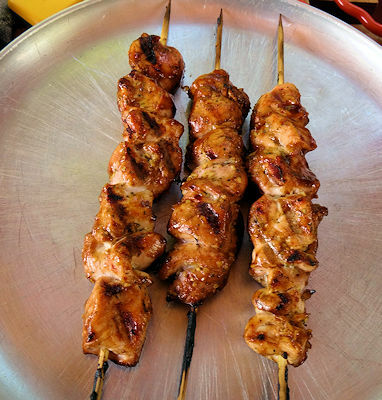 I sprinkled Louisiana Grills Chicken Seasoning on them and put them on bamboo skewers that had been soaked in water for 1/2 hour. I brushed them with the glaze and put them on the grill that had been preheated to 350 F. You can put them on a rack over a tray in a 350 F oven or cook by the indirect method in a barbecue. After 15 minutes, I turned them and brushed with the glaze. I smoked for 15 minutes and brushed with glaze twice more for a total of 45 minutes. I gave them a last brush of glaze and smoked for 5 more minutes. 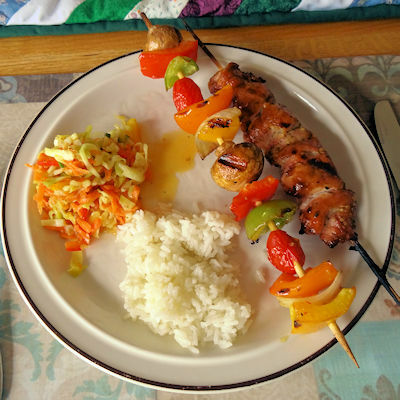 We served it with Easy Vegetable Brochettes (next post), rice and deli style coleslaw. Hoisin has a wonderful deep sweet flavour that could overpower chicken. I think the lemon juice gives this a freshness that offsets the sweetness. It makes a great balance and I really recommend this glaze. 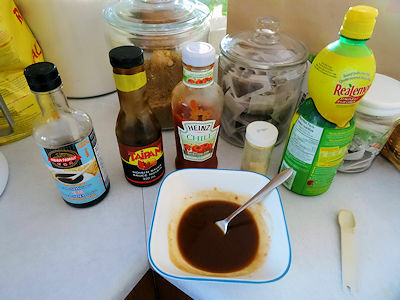 Mix Hoisin, soy sauce, chili sauce, lemon juice and ginger in a bowl. Toss the chicken with the chicken seasonings or rub. Put the chicken pieces on 3 bamboo skewers that have been soaked in water for 1/2 hour. Brush the chicken with the glaze and put it in a smoker that has been preheated to 350 F. You can also cook them on a rack over a tray in a 350 F oven or indirectly on a barbecue. After 15 minutes, turn and brush the chicken. Turn and brush the chicken twice more at 15 minutes intervals for a total smoke time of 45 minutes. Brush the chicken one last time and cook for 5 minutes more. Make sure the internal temperature of the chicken is over 165 F and serve. Thank you so much! It is one of my wife’s favourites too.